LONDON (Reuters) -- The outlook for Europe's car industry is "brutal" and there is no guarantee that all the main European manufacturers can survive the recession, European Union Industry Commissioner Guenter Verheugen said on Friday. "The outlook for the industry is, to say the least, brutal. We have seen a dramatic decrease of car sales, especially in the last quarter of 2008 with a drop of more than 20 percent, and we expect another drop of 20 percent for 2009 that will affect hundred of thousands if not millions of workers," Verheugen said in an interview with BBC radio. "There is no guarantee that all the main European manufacturers can survive the crisis," he said. The problems had been caused by a combination of a short-term demand crisis due to weak consumer confidence and production over-capacity in Europe, he said. European new passenger car sales fell 7.8 percent in 2008, their sharpest fall for 15 years, industry association ACEA said this week. EU business ministers, together with Verheugen, meet in Brussels later on Friday to discuss measures to help the car industry, which has been hard hit by the credit crunch and a drop in consumer spending. "First of all, I want to check whether member states are prepared to take coordinated action at European level," he said. "This is actually a request from the United Kingdom's government. (British Business Secretary) Peter Mandelson had suggested that we try this," he said. 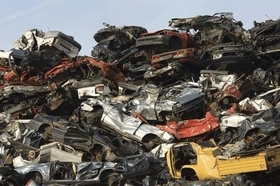 One measure that could be discussed was car scrapping schemes, where consumers buying a new car are paid to scrap their old one, or tax exemptions, Verheugen said. "The scrapping scheme combines a short-term economic incentive with a longer term environmental objective," Verheugen said, as new vehicles were more environmentally friendly. But Verheugen noted that the amount of money paid as a scrapping fee varied greatly between member states, which he said would distort competition within the EU. A bigger problem was the difficulties that car producers faced in getting access to finance, he said. "We know that the capacities which we have created via the European Investment Bank are probably not sufficient to meet the demand. This is going to be very, very difficult to find a solution for," he said. French President Nicolas Sarkozy said on Thursday that France would put "a lot of money" into aid for the struggling car industry. In Britain, luxury car maker Jaguar Land Rover, part of India's Tata Motors is calling for government help to weather the downturn. It wants the government to provide loans or loan guarantees to help it to secure bank funding.